Neurological manifestations of Fabry disease occur in both the peripheral nervous system (PNS) and central nervous system (CNS), with globotriaosylceramide (Gb3) accumulation in neurons, Schwann cells and dorsal root ganglia. 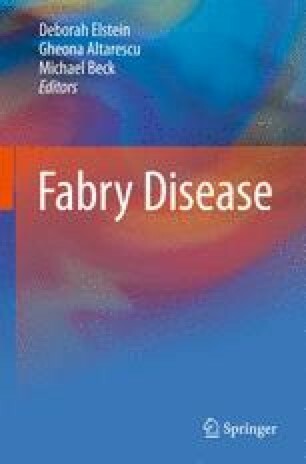 The abnormal Gb3 accumulation in neurons appears to have little clinical consequence on the natural history of Fabry disease. The vascular change in Fabry disease is considered to be responsible for increased regional cerebral blood flow (rCBF) documented in PET scans, especially in the posterior circulation. There is clear evidence for an increased number of lacunar infarctions, predominantly periventricular, as well as small cortical infarcts – in females as well as in males. However, the pathogenesis of Fabry vasculopathy remains mostly unclear, but is based on the combination of endothelial dysfunction and abnormal function control of the vessels. It is widely accepted that cerebral hyperperfusion, predominantly in the posterior cerebral circulation is an important cornerstone in the pathophysiology of stroke in Fabry disease. Additionally, inflammation seems to have an influence on the progress of the vasculopathy in Fabry disease. The majority of Fabry stroke patients both in the hemizygote and the heterozygote groups present symptoms and clinical signs of vertebrobasilar ischemia. Consequently, vertigo/dizziness, diplopia, dysarthria, nystagmus, ataxia are the most frequent symptoms in stroke patients with Fabry.